However, the main event of Abdul-Malik's video short was Mahdi Bray and Louis Farrakhan, the controversial leader of the Nation of Islam (NOI), hugging and professing their love for one another. The Muslim American Society was founded in 1992 by associates from the Muslim Brotherhood, including Mohammed Mahdi Akef, who would later become the international head of the Brotherhood. Given the radical roots of the organization, it stands to reason that Bray would cling to such extremism – as he did last month, when he attended an event sponsored by a group advocating for the restoration of the regime of Muslim Brotherhood leader Mohamed Morsi in Egypt. Morsi was taken from power by the Egyptian Military, which has since outlawed the Brotherhood, designating the Islamist group a terrorist organization. As reported by Steve Emerson and the Investigative Project on Terrorism (IPT), also attending was ex-USF professor Sami al-Arian, who previously had been sentenced to prison for his role as a North American leader of Palestinian Islamic Jihad (PIJ) and is currently under a separate indictment for criminal contempt in another terrorism case. The affair's sponsor, the Egypt Freedom Foundation (EFF), was incorporated in Washington, D.C. in October 2013. The group's organizer is Ahmed Bedier, a former director for the Hamas-related CAIR and former unofficial spokesman in the media for al-Arian. Bedier's involvement with this new group can, at least in part, be explained by the fact that his beloved brother, Amir, a fervent supporter of Osama bin Laden, was shot dead by the Egyptian Military during a Muslim Brotherhood demonstration, which Amir had taken part in. The similarity between Bedier's group's name and Bray's former group's may not be all coincidence. MAS has coordinated activities with EFF, co-sponsoring at least one event together at the Chicago-area Mosque Foundation (MF), a radical mosque that has held fundraisers for Palestinian terror-related entities. In its short existence, EFF has managed to attract terrorists, run events in terror-related mosques, and on top of that, invite Nazis to speak at their functions, as they did when they organized a lecture at Georgetown University featuring Egyptian Nazi Party co-founder, Ramy Jan.
About the particular event Mahdi Bray attended, he [Bray] tweeted, "Attending hearing on democracy & rule of law in #Egypt…" Ahmed Bedier, for his part, posted on Facebook and tweeted a photo of Morsi behind bars with the caption, "DEMOCRACY IN A CAGE." Bray, Bedier and most probably the other attendees confidently believe that the ousting of terror-leader Morsi was a blow to democracy, and the "rule of law" Bray mentioned was, no doubt, the Sharia law that accompanied Morsi to Egypt's highest level of power. It is fair to say that most people in civilized society reject the radical views and hatred which Louis Farrakhan and Ramy Jan espouse. 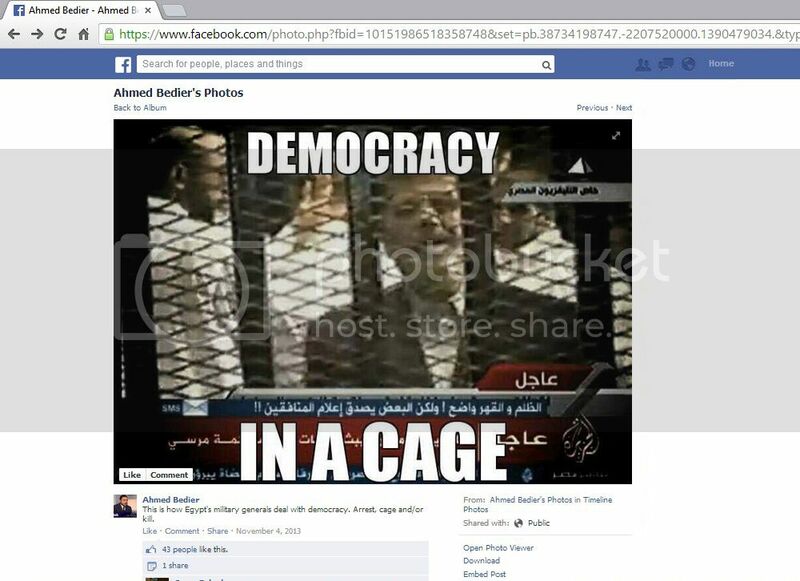 They also realize that terrorist leaders such as Mohamed Morsi are antithetical to democracy. But Mahdi Bray, Ahmed Bedier and their ilk exist in a parallel universe where good is evil and evil is good. The fact that they live and prosper in the West makes their world view all the more perverse. It is this sociopathic lack of conscience and any vestige of morality which makes the Islamist a menace to society and the greatest danger facing Western civilization in our time.